Cartoon Halloween background loop. Flying pumpkin heads with Skull and bones isolated on black background 4k. halloween card animation. terror and horror concept. halloween celebration concept. 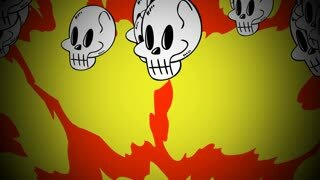 Cartoon Halloween background loop. Flying pumpkin heads isolated on black background full hd and 4k. halloween card animation. terror and horror concept. halloween celebration concept. Cartoon Halloween background loop. pumpkin heads animation isolated on black background full hd and 4k. halloween card animation. terror and horror concept. halloween celebration concept. 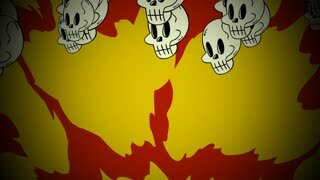 Cartoon Halloween Background Animation Loop. A spooky background of a haunted house with a full moon in the background. terror and horror background. Colorful halloween card full hd and 4k. Halloween Background, Looped. Jack-O-Lantern Halloween Pumpkin with scary face background. Halloween River Skull Background Cam 2 - Halloween Background include horrific river of insane animate skulls with warm color light. Halloween River Skull Background Cam 1 - Halloween Background include horrific river of insane animate skulls with warm color light. Halloween Hell Tunnel Loop 01 - Blue green Halloween Background included looping tunnel animation and lava style glowing lights. Halloween Hell Tunnel Loop 02 - Bloody Red Halloween Background included looping tunnel animation and lava style glowing lights. Halloween Hell Tunnel Loop 02 - Biohazard Green Halloween Background included looping tunnel animation and lava style glowing lights. Seamless animation of skeletons dancing salsa in a cemetery at night. Funny halloween background. Abstract colorful animation - Happy Halloween background. Scary moving trees at graveyard and flying bats at moon sky - seamless loop. Abstract colorful animation - Happy Halloween background. rotating and moving pumpkins - seamless loop. Halloween background animation with the bats and moon.